I was afraid of breaking from the prescribed, "Drink one every two hours," routine but I found listening to my body worked best. Having a juice whenever I felt hungry kept me wanting to break from the cleanse. Another tip: sipping throughout the day can help prevent your blood sugar from dropping. You may feel like you're getting your hydration in with all that liquid juice-but you need water! There is sodium in the juices as well as the fact that you're trying to flush all these toxins out of your body. DRINK AQUA! Personally, I like regular water as well as herbal tea. This cleanse I've been drinking a lot of Yogi Tea's Peach DeTox. It's a delicious blend of herbs that naturally support the body's cleansing processes and increased circulation. 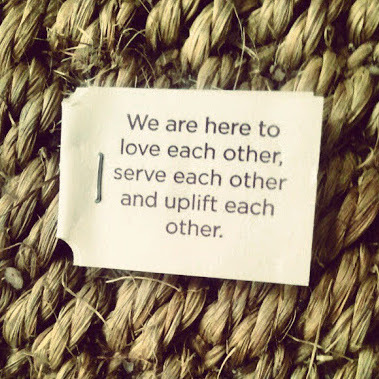 That and I love the positive messages each tea bag comes with. It's like a fortune cookie for tea. They're a perfect little pick-me-up while cleansing. The cleanses can come with two waters per day-at an additional cost. I sometimes get these but find that I am fine with my water or tea. The two usual waters from Pressed Juicery are Chlorophyll H20 and Aloe Vera H20. Descriptions from there sight for each is below. So all this drinking juice and water and tea will mean you have to pee a lot. So just keep that in mind when you're planning your day. What is your favorite herbal tea or special water? Do you have any recipes of your own? Share below!